From a dream of economic development to the Pasadena Bio Collaborative of today. Bill Bogaard and Bruce Blomstrom. 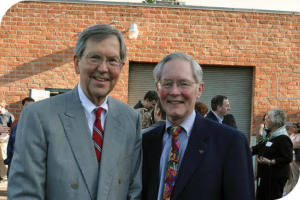 Between 1999-2001 California Senator Jack Scott twice brokered legislative allocations to support an initiative spearheaded by Mayor Bill Bogaard which would eventually become the Pasadena Bioscience Collaborative (PBC). The goal at inception was to incubate viable scientific ideas into companies and bridge industry employment needs with training from regional colleges and universities – to improve the local economy, quality of educational offerings and employment opportunities. Since opening its doors in 2004, the Pasadena Bioscience Collaborative has experienced remarkable growth, expanding from a 500-square foot operation to over 12,600 square feet in 2016. To position itself for the future as a key provider of wetlab space in Los Angeles County, PBC has refurbished its facilities and debuted a new look and branding strategy under the Pasadena Bio Collaborative Incubator banner. Allied with the LA Biotech Corridor, Pasadena Bio is a cornerstone in the Los Angeles life science community and longtime collaborator with Caltech, the California State University system, Huntington Medical Research Institutes and myriad specialists in the industry. Original PBC Location - 500sq and 2 tenants! As of Spring 2017, we rent space to over 20 companies with interests ranging from medical devices, manufacturing, process development, material sciences, small molecule chemistry and drug delivery. With a renewed and expanded focus on workforce development, Pasadena Bio is a major contributor to connecting regional resources for biotechnology, chemistry and life science research. Tenants at Pasadena Bio are entrepreneurial scientists exploring innovations and who have secured initial funding as a legal entity. Biotech start-ups find their world is complex, expensive and risky. At Pasadena Bio tenants find mentors and resources to augment their experience in the business of science. With a wide range of shared-use equipment and support services, PBC enables entrepreneurs to develop proof-of-principle for their particular applications while retaining 100% of their Intellectual Property. Business and government leaders have supported the PBC concept which seeks to grow and retain businesses created by scientists in Southern California. 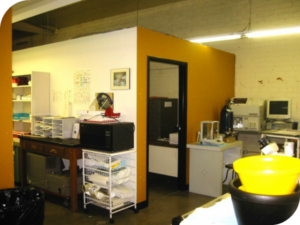 Referrals to the wetlab incubator have come from leading universities and research hospitals. Under the umbrella of the Pasadena Bio Collaborative Incubator, both the PBC Wetlab and PBC Training divisions are a result of planning by individuals from many different sectors – government, education, non-profits, and private industry. PBC training programs have impacted both secondary and higher education, with workshops and collaborations.